Calacas Shower Gel // This shower gel was a limited edition from the Kitchen and one I've heard so many people rave about it. The colour and scent reminds me of mountain dew although I can't really remember what it tastes like. It also reminds me of fruit pastilles and is a mix of lemon, lime and neroli. I really love it and hope it is brought back again at some point so I can buy another bottle. Just look at the colour! 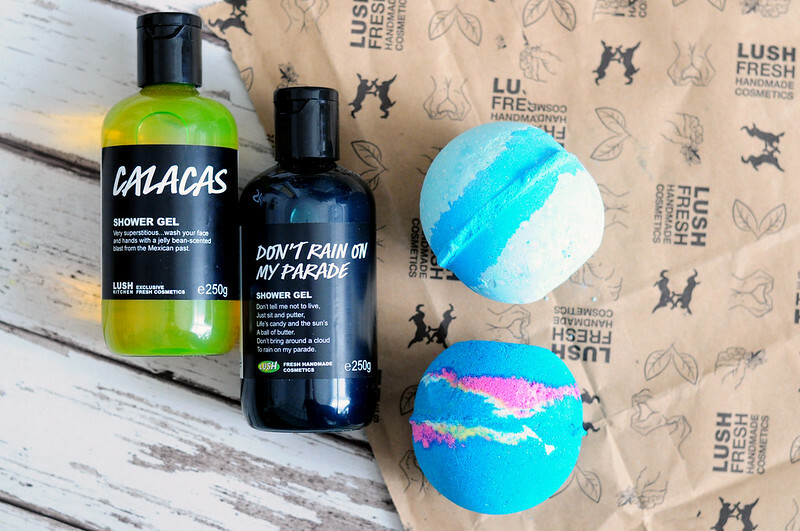 Don't Rain On My Parade Shower Gel | £4.75 - £27.50 // You can also buy this shower gel as a bath sheet, but I'm not so keen on it so stuck with the normal shower gel. When I first smelt this I wasn't sure if I actually liked it, but it has grown on me and the more I smell the more I like it. It's a lovely dark green colour and the scent is blueberry, vanilla and violet. Frozen Bath Bomb | £3.95 // With how popular Frozen has become it was only time that Lush created a Frozen bath bomb. It lends itself really well to a bath bomb and I love the grapefruit, neroli and rose scent. Intergalactic Bath Bomb | £3.95 // I love the peppermint as it's unusual to find in bath products. There is also popping candy, shimmer and various colours! This is one of my favourites. Lush never disappoints! I've used those bath bombs recently and loved them both. I think Intergalactic was my fave too though. So pretty!